Our dry-wipe gloss magnetic sheet is available pre-laminated with a choice of colours and the magnetic side is UV coated. 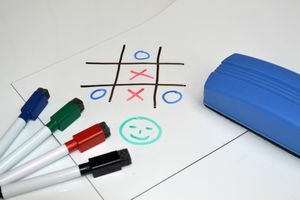 The gloss finish is dry-wipe and is suitable for digital and screen printing processes.With this magnetic whiteboard sheet you can turn an iron surface into a whiteboard in no time. Just cut the sheet to the desired size and attach it to an iron surface. Now you can write on it with dry erase markers. When you are done using it, you can just remove the sheet, roll it up or put it up somewhere else. Ideal for use in the office or classroom, booth or store construction. Flexible dry-wipe magnets are the perfect solution for creating magnetic labels or instant noticeboards. Our dry-wipe labels and whiteboard sheets have a dry-wipe gloss surface on the front face so you can write on them with a dry-wipe marker pen then easily erase what you have written – perfect for home or business! Flexible vinyl sheet is magnetic rubber which has a bright gloss coloured vinyl top layer plus a dry wipe top layer. The clear top layer lamination ensures that you can write on the sheets with dry wipe pens - they wipe off easily afterwards. The Natural version is plain (no vinyl, no dry wipe finish) - you can add your own artwork onto this. We can also print and cut out your own artwork onto the magnetic vinyl and add extra features such as dry wipe, magnetically receptive printed top layers, etc and we can cut to shape as well if required. 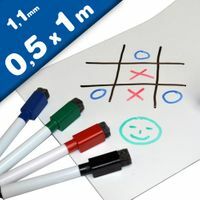 Ideal for charts, planning boards, magnetic signs, games and puzzles. The label magnets and whiteboard sheets are easily cut to size using scissors, trimming knives or roller cutters; they are non-toxic and are compatible with solvent and UV ink. Using flexible magnetic sheet is an excellent way to produce a high impact visual display. Flexible magnetic sheet can also be applied to point of sale applications to give a quick response in a fast changing environment. Either printed directly or used with a self adhesive backing so it can be applied to a traditional print. Magnosphere Magnet-Shop supplies a wide range of finishes and thickness on our flexible magnetic sheet and the high quality is matched by some of the highest holding forces available in the industry today. Dry-wipe coloured vinyl magnetic sheets allow printers to print directly onto the magnetic sheets. This makes printing much quicker as printers don’t have to laminate the plain magnetic rolls themselves. Magnetic displays can be quickly easily removed and then reapplied as required, making them perfect for retail POS, posters and other graphics. The magnetic sheets are available pre-laminated in either gloss or matt finish, with a selection of thicknesses available to suit your specific requirements, and the magnetic side is UV coated. Our customers often use coloured vinyl sheets for retail displays. The vinyl is suitable for (eco) solvent, UV and screen printing. Who supplies high quality A4 / A3 Magnetic Sheets? Magnosphere offers best priced A4 / A3 Magnetic Sheets globally to all industries, including Automotive, Aerospace, Military, Advertising, Design House, Electronic and Academic/R&D. Please inquire for custom Neodymium magnets or magnetic assembly. Buy A4 / A3 Magnetic Sheets at Magnosphere and get a better deal!